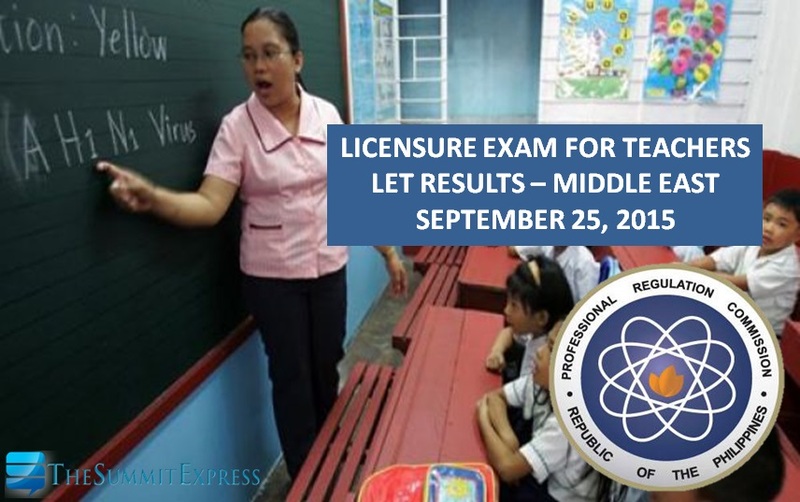 MANILA, Philippines - The Professional Regulation Commission (PRC) and the Board for Professional Teachers (BPT) officially announced on Thursday, November 5, 2015 the results of September 2015 Licensure Examination for Teacher (LET) conducted in the Middle East. PRC named a total of 20 elementary teachers out of 65 examinees (30.77%) and 37 secondary teachers out of 109 examinees (33.94%) who have successfully passed the Licensure Examination for Teachers (L.E.T.) in: Abu Dhabi, United Arab Emirates; Al-Khobar, Jeddah and Riyadh, Kingdom of Saudi Arabia, Doha, Qatar and in Kuwait. Meanwhile, those awaiting results for the teachers board exam (LET) conducted in several testing centers in the Philippines on September 27, 2015 may check updates on this page (List of Passers: LET Results September 2015 teachers board exam). Follow Us on Twitter or Like Us on Facebook for more updates on LET.